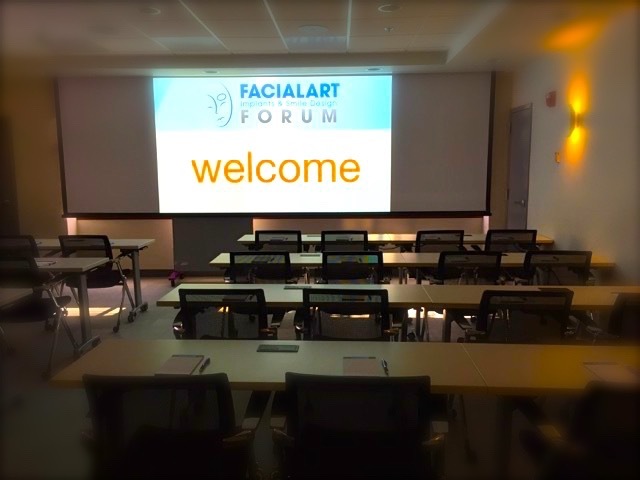 The Forum is a unique conference room designed specifically for meetings and educational events. It is equipped with a large screen monitor, dual projectors and a remarkable widescreen that supports 3:1 ratio presentations for an amazing visual experience. Also, it has the capability of recording the programs for video and webinar broadcasts. With its unique location, set-up, and guest services, this facility is a great fit study club meetings, educational programs, board meetings, and other conferences. It can be reserved for evening, half day, or full day events and can be catered with a range of food and drink options for a remarkable experience. The Forum is located in downtown Bethesda on Bethesda Avenue between the Apple Store and Barnes & Noble. With plenty of parking, restaurants, shopping, and hotels, all within walking distance, The Forum offers an ideal location for you to host your next meeting. The Forum Conference Room from H. Ryan Kazemi, DMD on Vimeo. Reserve ‘The Forum’ for your next meeting, conference, presentation, or training. The room has a capacity for up to 40 people and can be configured to meet your needs from a conference table, to a classroom, or theater seating. The room is equipped with a projector, wide projection screen, microphone system, individual work stations, an integrated video and sound system to record or broadcast your meeting. Breakfast, lunch, and dinner menus are available along with beverages and break snacks during the meeting. Or you can host a lunch or dinner at one of the many restaurants within walking distance on Bethesda Avenue. The conference room can be reserved for evening, half-day, or full-day events. The pricing for room is listed below. For food and beverage selection and cost, click here. The room is equipped with a projector, a wide projection screen, a microphone system, individual work stations, and an integrated video and sound system to record or broadcast your meeting. Breakfast, lunch, and dinner menus are available along with beverages and break snacks during the meeting. Or, you can host a lunch or dinner at one of the many restaurants within walking distance on Bethesda Avenue. The Forum is located in downtown Bethesda on Bethesda Avenue between the Apple Store and Barnes & Noble. With plenty of parking, restaurants, shopping, and hotels, all within walking distance; The Forum offers an ideal location to host your next meeting.